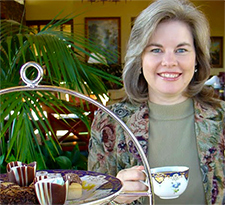 Do you need an easy appetizer for your next tea party? Here’s one of my go-tos, especially in the summer because I can go get a bell pepper right out of the garden. The fresh and crisp bell pepper is a nice contrast to the chewy scones and sandwiches. It’s also a great gluten-free snack, chock full of Vitamin C.
Slice up the bell pepper into rather thick wedges. When slicing the bell pepper, don’t cut off the bottom. Leave it on so it hooks over to make the little handles as shown. 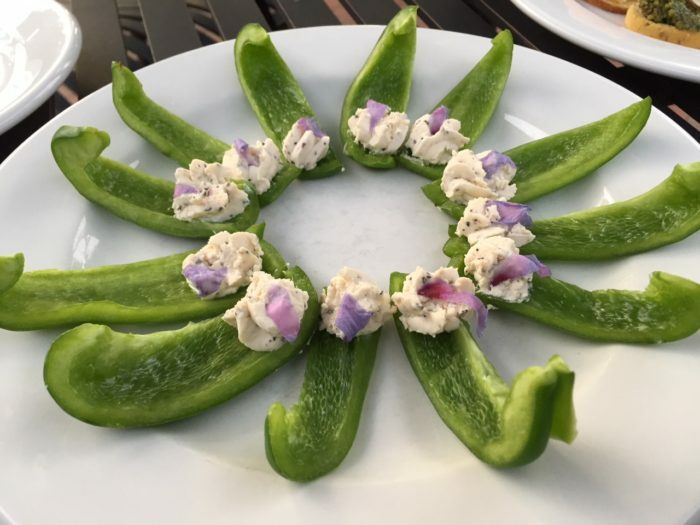 It makes an easy way to pick up the appetizer – plus it’s pretty! Any soft creamy cheese spread will work so use your favorite. Here I used Boursin cheese. A little cake decorator bag was handy to squeeze little dollops onto the flat side of the slices away from the handles and then garnished it with a small piece from a Rose of Sharon flower petal. I like things in threes so I wanted something to use as a garnish. The purple petal provided a nice pop of contrasting color and, best part of all, I just went to the yard again and grabbed one. 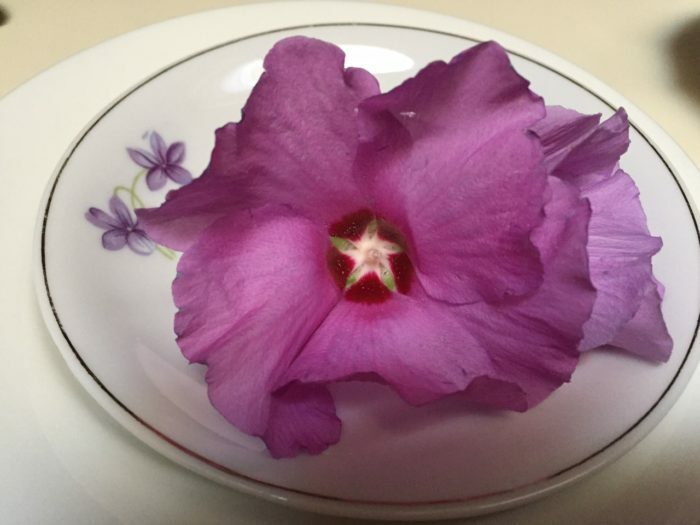 Did you know that Rose of Sharon is one of many edible flowers? It makes sense when you look at the flower and you see the resemblance to Hibiscus and Okra flowers. All are related to each other. Other edible flowers you could use if you don’t have Rose of Sharon on hand: hibiscus, roses, tulips, violets, lavender, or a sprig of your favorite herb. There you go. Something easy to make and take to your next party!